CHICAGO (CNS) — Religious and clergy alike do their part to help the Ramblers’ men’s basketball team at Loyola University Chicago. The team’s chaplain since 1994 has been Sister Jean Dolores Schmidt, a Sister of Charity of the Blessed Virgin Mary, who is now 97 years old. She also is the newest member of Loyola’s sports hall of fame. She was inducted Jan. 21. Sister Jean has become a fixture on campus, even getting her own bobblehead day before a game in appreciation for her service. She keeps an office in the Student Center where her door is always open, and she lives in a dorm with 400 undergraduate students, where she also serves as their chaplain. “I love every one of them,” she told the Chicago Catholic, newspaper of the Archdiocese of Chicago. “I talk about the game to them and then they go out and play.” In addition to the team, Sister Jean also leads the entire crowd in a prayer before tip-off. The 5-foot nun can be seen at every home game of the men’s team. She’s most often decked out in Loyola gear and wearing her trademark maroon Nike tennis shoes with gold laces that have “Sister” stitched onto the heel of her left shoe and “Jean” stitched on the heel of her right shoe. 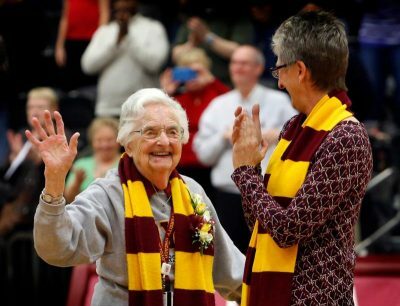 Born in San Francisco in 1919, Sister Jean played six-on-six girls’ basketball in high school. Returning to California after entering the convent in Iowa — she joined the order in 1937 when she was 18 — she taught elementary school and volunteered as a coach in public schools in Los Angeles when she was teaching in that city. She coached everything from girls’ basketball, volleyball and softball to Ping-Pong and the yo-yo. She told ESPN she had her girls’ team played against the boys to “toughen” them. Two of Bob Hope’s children were Sister Jean’s students, and the children of Frank Sinatra and John Wayne also attended the school, she said. In 1961, Sister Jean took a teaching job at Mundelein College, the women’s college that prepared its students to teach, which was located next to Loyola in Chicago’s Rogers Park neighborhood. She remembers when, two years later, the Loyola Ramblers beat the University of Cincinnati in the NCAA men’s basketball championship game. Mundelein merged with Loyola in 1991, and she moved along with it. In 1994, Sister Jean became chaplain of the men’s basketball team. She has missed only two home games since then. Sister Jean gets healthy cheers from the home crowd when her name is announced over the public address system. And during the game, she cheers at the good moments and winces at the bad. Before home games, Sister Jean waits for the team and sits on a bench near the entrance to the court where the players come in. Students stop by to say hello. Referees come over to hug her. During games she sits up behind the home bench intently watching the action. After games she emails each player pointing out what they did well and what they can work on. When Loyola Coach Porter Moser took the job in 2011, one of the first people he heard from was Sister Jean, who gave him a scouting report of all the players. Off the court, she reviews the stats of Loyola’s next opponents online and confers with the players and the coach. 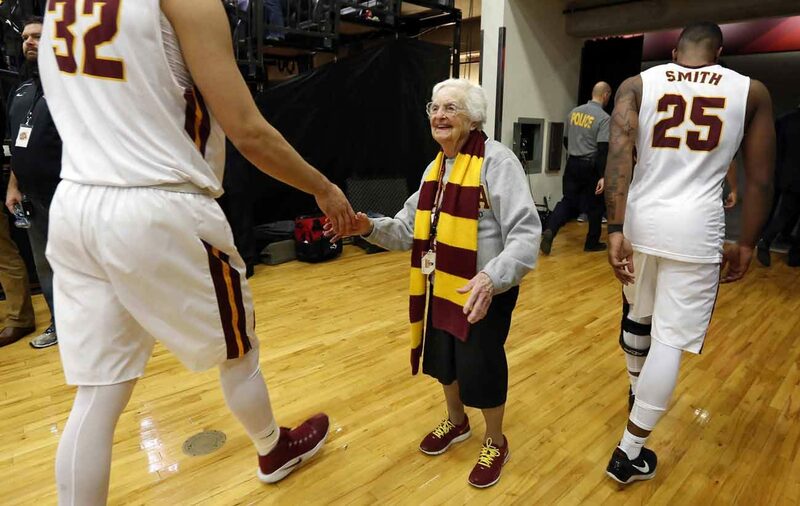 One testament to her longevity is that Sister Jean is now on her fifth coach. Loyola’s Jesuits also have their role to play with the basketball program. On Feb. 20, two days before the last home game of the season — known on campus as the Jesuit Jam — several priests unveiled a new video made to the tune of Chance the Rapper’s “No Problem.” Called “Jesu-Lit,” the video features not only Sister Jean but also Loyola’s president, Jo Ann Rooney. It can be viewed at https://tinyurl.com/jpfemf9. It was created by Jesuit Father Michael Martinez, who goes by the moniker “Miami Mike” in the video. The video might have worked. Loyola beat Drake — the university, not the hip-hop star — 80-65 on Feb. 22. Next up for the team is the Missouri Valley Conference tournament in St. Louis. Due to the tourney location, it’s known as Arch Madness. Contributing to this story was Joyce Duriga, editor of the Chicago Catholic, newspaper of the Archdiocese of Chicago.